The Stamp Store, providing decorative concrete products, services and training, is holding a two day concrete countertop class at their headquarters in Oklahoma City, Oklahoma. This class will include both studio cast and cast-in-place techniques for the enCOUNTER concrete countertop system, taught in a hands on approach with personal attention given to each participant. The enCOUNTER concrete countertop system was developed by seasoned concrete professional Doug Bannister to produce consistently beautiful results across a wide variety of applications; including concrete countertops, tables, shelving, back splashes, baseboards, fireplace surrounds and sinks in both cast-in-place and pre-cast methods. Color, form, and texture can also be completely customized with the complementary products included in the enCOUNTER product line. enMAGIC, enCOLOR, enFORM and enPOXY are just a few of the additional products available to customize and enhance the enCOUNTER countertops. The strength of the enCOUNTER concrete mix is also top of the line, undergoing rigorous research, development and testing to reach a final strength of 8,870 psi in 28 days, nearly three times the strength of regular concrete. 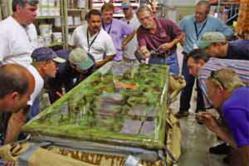 The enCOUNTER training class, to be held October 18-19, 2012, will include expert advice and hands-on training in coloring, reinforcement and protective coatings, as well as polishing and special effects to give participants the practice and confidence needed to create truly unique custom concrete countertops. For more information on this enCOUNTER concrete countertop training session, visit enCOUNTER online.